Law firm Womble Bond Dickinson will be moving into the tower’s 15th floor in mid-2019, developers The Meridian Group and Rockefeller Group announced Tuesday morning. 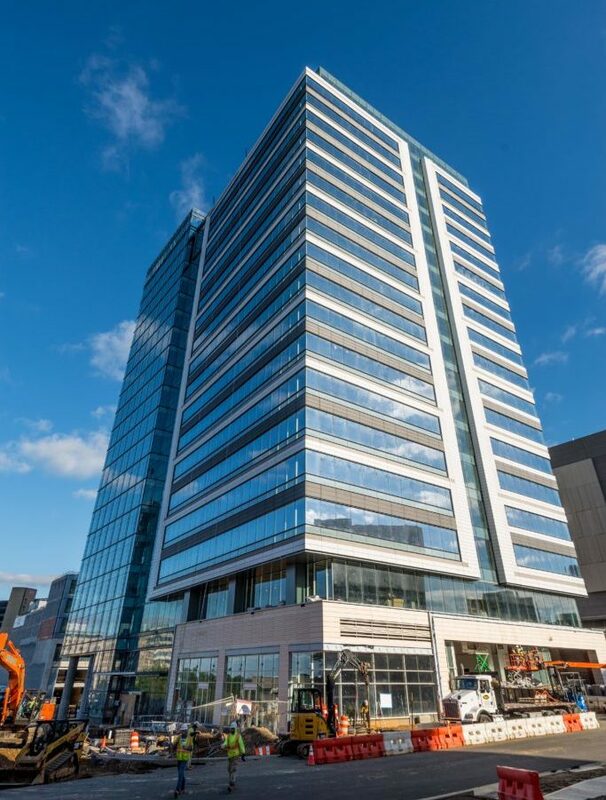 The under-construction, 20-story office tower, part of the massive Boro development next to the Greensboro Metro station in Tysons, is now 68 percent leased. Other announced tenants include the soon-to-be-relocated headquarters of Tysons-based TV station group TEGNA and the law firm Hogan Lovells. The law firm will lease 24,239 square feet – the Tower’s entire 15th floor — beginning in mid-2019. The building is now 68 percent preleased ahead of construction completion, with about 135,000 square feet of office space remaining. “We are excited and proud to welcome this outstanding law firm to Boro Tower,” said David Cheek, President of The Meridian Group, which is developing The Boro. Today’s announcement continues the momentum for the mixed-use development. “Womble Bond Dickinson joins a premier lineup of firms, companies and organizations that have chosen The Boro for their new location,” said Gary Block, Chief Investment Officer of The Meridian Group. 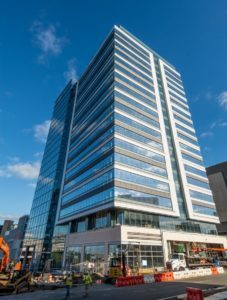 Womble Bond Dickinson will relocate its Tysons office at 8065 Leesburg Pike about a mile away. Approximately 40 of the firm’s attorneys and staff will work at Boro Tower. Meridian and Rockefeller Group are co-developing the Gensler-designed, 437,000-square-foot trophy office tower. From its vantage on “The Hill” – the highest ground elevation in Fairfax County -Boro Tower offers panoramic views from the Blue Ridge Mountains to downtown Washington, D.C. The 20-story building, designed to achieve LEED Gold certification, features a shimmering glass curtain wall, accented by a modern, white-glazed terra cotta. The Tower offers 9- to 10-foot finished ceilings and ideally sized, efficient floorplates that minimize columns and maximize daylight and views. The building boasts ample amenities, including a rooftop terrace, fitness center, locker rooms and bicycle storage that perfectly complement the 10,000 SF of lobby level retail space. CBRE’s Rob Faktorow and Terry Reiley represented The Meridian Group and the Rockefeller Group in the leasing deal. Womble Bond Dickinson was represented by Mike Shuler and Nate Krill at Avison Young. Womble Bond Dickinson is the fourth major tenant to select Boro Tower for its offices. Big Four accounting firm KPMG, which announced last month that it will lease up to seven floors of the Tower. Global law firm Hogan Lovells, which will occupy the Tower’s entire 17th floor and the majority of its 16th floor. Media company TEGNA, which is moving its headquarters to the top two floors. Boro Tower is located in the heart of The Boro, Meridian Group’s amenity-rich development. Located within steps of the Greensboro Metro station, The Boro will be the premier Metro-oriented, mixed-use destination in Tysons. The 15-acre development will consist of a dynamic mix of office, rental and for-sale residential, retail, entertainment and open park space – a walkable urban environment that has long been sought in Tysons. The Boro’s dramatic 1.7 million-square-foot first phase, on schedule for completion in 2019, will deliver nearly 700 residential units, 260,000 square feet of destination retail and Boro Tower. Ideally located near Route 7, Route 123 and Greensboro Drive, The Boro is designed to bring people outside — with pedestrian-friendly roadways, attractive open spaces and a variety of restaurants offering outdoor seating. The Boro has already attracted such best-in-class companies as Whole Foods Market, which is planning a 69,000-square-foot flagship location; and Kerasotes ShowPlace ICON Theatres, which will open a luxurious new cinema with 15 state-of-the-art screens and upscale dining options.